Mangaluru, Mar 4, 2017: Delivering convocation address at the 35th annual convocation of Mangalore University (MU) on March 3, Friday, Indian National Science Academy president and chairman of Nano Science Advisory Group, Nanomission, Prof Ajay K Sood, said the inter relations if disciplines of science, humanities, commerce, management and education is the key mantra to make a mark in the 21st century world order. He went on to say, the interdisciplinary research will usher in the convergence of different fields in a meaningful way. It also helps one to ask valid questions, leading to exciting research problems and solutions, he added. Prof Sood said India is on a high slope of growth and respectability in the world and expressed concern that the country is passing through a critical phase of quality of education. Today, the world is looking at India with admiration and expectations that will contribute in solving global, issues plaguing mankind, such as clean energy, water remediation, clean environment and sustainable growth, he said. He urged the graduates to push the frontiers of knowledge and translate the knowledge into societal development. "Creativity should become part of your DNA," he told the students. Prof Sood said technology is changing much faster for the younger generation than ever before. It is a wonderful time for the younger generation to be a part of the exciting period of science and technology, he added and called upon the students to contribute to the scientific, technological and societal challengers of the future. Congratulating the degree recipients, he said the degree has given the students a passport to a new life, new respect, prosperity to the family and country. Honoris Causa was conferred on folklorist B A Viveka Rai by Minister for Higher Education Basavaraj Rayareddi on the occasion. Receiving the honorary degree, Dr Rai said, "Mangalore University has moulded my personality and helped in the growth of my career for 34 years. It has given me strength. It is a great honour to receive this honorary degree. After 11 years of my retirement, I am receiving a degree along with my youth crowd." He said the campus of the university should keep a distance from political parties. "One need to learn to live in a community where the principles of secularism and social aspects are given utmost important." Vice chancellor K Byrappa was present. 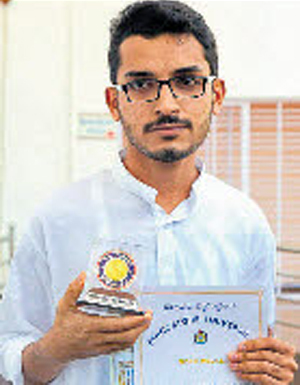 Among the gold medal winners, Musthafa K H, son of an autorickshaw driver Hasainar in Madapura, Madikeri, won one gold medal and five cash prizes with first rank in MA Kannada. He has won Dharmasthala Rathnavarma Heggade Memorial Gold Medal, Srimathi Vasantha S Ananthanarauana and Prof S Ananthanarayana Cash Prize in Kannada, Kerody Subba Rao Memorial Cash Prize, Late B N Gupta Trustee Janmabhoomi Press Truth Memorial Cash Prize and cash prize instituted in honour of Dr B Damodar Rao. He said it is the love for the language which helped him to pursue postgraduation in Kannada. An avid reader who was influenced by the writings of Poornachandra Tejaswi, Musthafa said that Tejaswi’s writings have entered all spheres of life. "My father who is an auto driver earns Rs 300 to 400 per day. He is the sole bread winner of a family of four persons, including my sister. I stayed in BCM hostel during my PG studies and used to contribute articles for newspapers, participate in debate and elocution competition. The prize money would come as a pocket money. In addition, my parents and lecturers were all supportive. I have a collection of 2,000 books," he said. He completed his graduation from FMKMC College in Madikeri. Musthafa, who is teaching in Alva’s PU College, will pursue his PhD studies. Interest : Interest in the subjects is what put this girl from Nagaland in the pinnacle of glory when she received two gold medals, three cash prizes and first rank in MA History. Keneiseno Neihu has won Late Dr Gururaja Bhat Gold Medal, Late Dr Paduru Gururala Bhat Memorial Gold Medal, Prof B Sheik Ali Felicitation Committee cash prize, Dr P Gururaja Bhat Memorial Cash prize and Aubrey D’Souza Charitable Foundation prize. "I was interested in history since my school days though my parents wanted me to pursue studies in medicine. But my mother did not force me and supported me in my venture throughout. As I chose the subject of my choice, I wanted to achieve something and the result is two gold medals, and three cash prizes," she said. 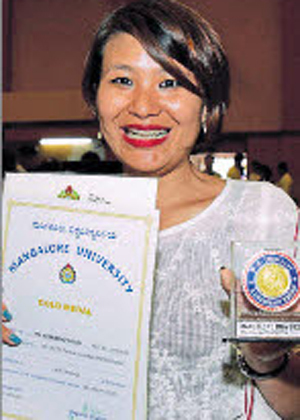 She said she had not even heard of Mangaluru till she landed here to pursue her graduation at St Aloysius College. She said that there is no racial discrimination here and the people of the city are friendly. Right now, Neihu is pursuing her PhD programme at Dibrugarh University in Assam. Yakshagana dancer : Deevith of Alva’s College has won Dr TMA Pai Endowment Gold medal in Mass Communication and Journalism and Late Sri Ramakrishna Mallya Gold Medal with cash prizes and first rank. As a Yakshagana artiste, he has performed in more than 400 Yakshagana shows. He is the son of Sridhar Kotian and Lalitha of Peradi in Belthangady. His father is a tailor and mother rolls beedi for livelihood and have been supporting the education of their children. At present, he is working as a lecturer at Alva’s College and also coordinator of Alva’s Dheenkita Yakshagana Study Centre. Other students who won two gold medals are Greeshma T Nair - Mulla Salehbhai M A Vagh Gold Medal, Kumbla Ramdas Rangappa Nayak Memorial Gold Medal in Applied Botany; Saranya Sasidharan - Manjeshwara Mukund Prabhu Memorial Gold Medal and Prof K K Vijayalakshmi Memorial Gold Medal in MSc in Applied Zoology; Vishakha Rai P - Prof B Shivarama Holla Gold Medal, Dr A M Abdul Khader Gold medal in MSc Chemistry; Latha Serrao - Syngenta Gold Medal and ICRAIEST -2009 Gold Medal in Msc Industrial Chemistry; Madhava Mallya - Prof K Siddappa Gold Medal and Second International Conference on Po and Radioactive Pb Gold Medal; Supritha Naik - Mangalagangotri Commerce Pioneers Gold Medal and Smt Lakshmi Soma Bangera Kodikanyana Memorial Gold Medal in MCom and Ashwini Jain - Dr TMA Pai Gold Medal and Dr C T Abraham Gold Medal in BA. Confusion : The smooth conduct of presentation of degrees to students by Pro Chancellor Basavaraj Rayareddi was disrupted thrice during the convocation. The students felt offended when officials started searching for the degree awards. This also created confusion for sometime. Some students, after arriving at the stage to receive the degrees, were asked to stand behind and were given degrees later. To avoid further confusion, even Rayareddi was seen confirming the name of the student while giving away the degree. How ever all concerned rose to the occasion.